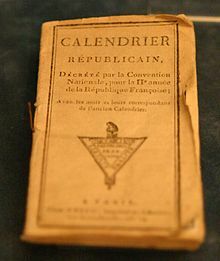 Sylvain Maréchal, prominent anticlerical atheist, published the first edition of his Almanach des Honnêtes-gens (Almanac of Honest People) in 1788. On pages 14–15 appears a calendar, consisting of twelve months. The first month is "Mars, ou Princeps" (March, or First), the last month is "Février, ou Duodécembre" (February, or Twelfth). (The months of September [meaning "the seventh"] through December [meaning "the tenth"] are already numeric names, although their meanings do not match their positions in either the Julian or the Gregorian calendar since the Romans added the months January and February to the original ten-month March to December year of King Romulus.) The lengths of the months are the same as the lengths given them by Julius Caesar; however, the 10th, 20th, and 30th are singled out of each month as the end of a décade (group of ten). Individual days were assigned, instead of to the traditional saints, to people noteworthy for mostly secular achievements; 25 December is assigned to both Jesus and Newton. Later editions of the almanac would switch to the Republican Calendar.